Do hot funds stay hot? With the large number of mutual funds available, choosing the right funds can be a challenge. What are the factors you consider when deciding to purchase a mutual fund? Do you focus on past performance alone, or do you also consider the track record of the portfolio manager, his or her investment style, and the risk controls the fund has in place? Despite the tag line that often accompanies performance figures – "Past performance is no guarantee of future returns" – many investors place performance numbers near the top of the list. Indeed, historical studies and anecdotal evidence suggest that mutual fund performance numbers are influential in motivating investors into and out of individual mutual funds. Many industry observers also try to draw meaningful conclusions from past results. You've probably come across systems that rate funds (four out of five stars, for example) based on performance. The financial sections of newspapers typically publish the top ten mutual funds for the week, the month, or year, as does this newsletter. Can past fund performance in some way indicate or predict future success? In a recently completed study, ScotiaMcLeod looked at the performance history of 80 Canadian equity mutual funds over the past 10 years. To gauge future performance, each mutual fund's performance for a specified period was compared with the period that followed it. For example, a fund's performance for the three-year period from March 1992 to March 1995 would be compared against its results for the subsequent period of March 1995 to March 1998. The study attempted to find out if past results are a good indicator of future performance. If they are a reliable indicator, then top-performing funds (defined as the top 20%, or first 'quintile') should tend to put up better returns than other funds in subsequent periods. The top 20% of Canadian Equity funds did not generally outperform in subsequent periods. Funds in each of the five quintiles produced remarkably similar returns in future periods. The chart on the next page provides a graphic summary of the study's findings. 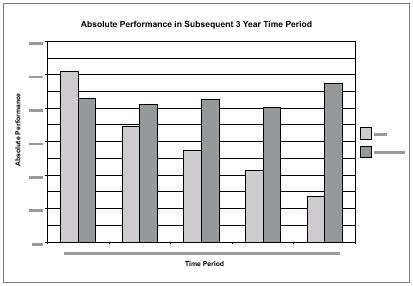 The study shows that performance history is an unreliable guide to selecting top- performing mutual funds. It also points in the direction of other fund variables – including the funds' portfolio managers, fund mandates, investment styles, and risk controls – and the role they play in helping identify whether historical results can be repeated successfully over time. Focusing on the fundamentals mutual fund money management, rather than past performance alone, is a more comprehensive way to select mutual funds. It is this philosophy that under-lies our recommendations in our Investment Options Newsletter (Quarterly publication). For many investors, taking a comprehensive approach can be difficult and time consuming. That's where we can help. By taking into account the many fund variables and the investment climate in which the funds operate, we can help you make the right investment decisions. Or, do cold funds stay cold? The answer to both question is often no. Funds with great three-year performance did about as well as funds with lower three-year results in subsequent years. The ScotiaMcLeod study looking at past performance showed this: Past performance alone will not help you predict whether great (or mediocre) results are likely to be repeated. In the chart below, the initial period results show the top 20% having the best performance, the next 20% not doing as well, and so on down the line, as you would expect. The subsequent period numbers, however, don't differ that much among the quintiles. This means that simply selecting a fund with a hot return in the past doesn't mean it will stay hot. Selected just on the basis of past performance, the fund is as likely to do well in subsequent years as a fund anywhere else in the performance spectrum. This all serves to reinforce our fundamental buy and hold philosophy. 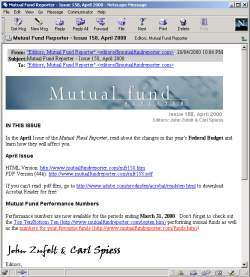 Why not apply to receive the Mutual Fund Reporter, delivered conveniently every month via e-mail? Visit our subscriptions page at: http://managedmoneyreporter.ca/subscribe/. If you currently receive the paper version (a.k.a snail mail version) of the Mutual Fund reporter, you can complete and return the reply card enclosed in the June issue to switch to the e-mail version and save a few trees. They have also had name changes – the 20/20 has been removed from most fund names that had resulted from the previous merger of AGF and 20/20 funds.